Just a warning: please don't try to eat these caps! 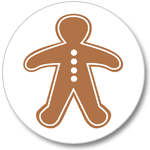 An equal amount of gingerbread men and women in each pack. We tried to pack in the gingerbread smell, but we are having trouble.